Hello. We are Alberto Carabarin and Adriana Jordan, Centre Directors of Mathnasium of Kanata, your neighbourhood math-only learning centre. We help kids in grades 2-12 understand math by teaching the way that makes sense to them. 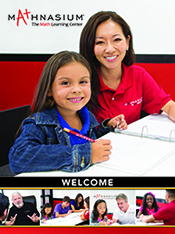 -Enroll now and take advantage of our back-to-school rates. -Drop by to learn how our system works and why children love it so much. -Take advantage of our RISK-FREE assessment. -Learn about our referral program and how it can benefit you. After being behind in math, both my kids were able to catch up after attending a few months of Mathnesium. I also appreciate the fact that it's close by. I highly recommend it. The staff are very patient and helpful with my son's questions. Mathnasium has provided him with the tools that he needs to be successful and teaching him new helpful ways in Math. Staff are really knowledgeable and pleasant. My son’s grades went from a 47 to a 98 in a matter of a few weeks. He enjoys going to Mathnasium and enjoys Math at school again! The one on one attention and a course designed for my daughters needs has helped her tremendously. The staff are always very patient and helpful with our daughter's questions. Mathnasium has provided her with the tools that she needs to be successful and is a major reason why she passed all of her academic level high school math courses. When my daughter started at Mathnasium she was barely getting a passing grade. Now she is top of her class! At Mathnasium they use a variety of methods to explain the concepts to her until she fully understands them. I found the service very flexible which made for a personalized experience for my son. The staff is friendly and efficient. Money well spent and will definitely use the service again. It made a big difference in my son’s performance. Thank you for the awesome work. Daughter's confidence when tackling a math problem has increased exponentially. She is now at least willing to tackle a problem that she may not understand fully. Before she would just give up before even starting. I think Mathnasium is one of the best place to learn Maths for young minds. I like their technique. It’s more about understanding than remembering the methods. I’ve seen significant growth in my child’s logical thinking and math skills. All the best! Great business model. Kids are also driven by prizes, so it is good to have that element. My child how was getting c in her maths in an year ago now is getting A most of the time and it’s all because of the hard work this program and their team. I will highly recommend this program to anyone whose children are struggling with Maths. The instructors are great and very helpful. Our two children’s are progressing well and getting high grades. We are very satisfied with Mathnasium. My Daughter has gone from a grade point average of less than 50% to 88% in 3 months. And she likes going to the classes at Mathnasium. Thanks. Richard Keirans Stittsville , On. It has been extremely helpful to have qualified resources available to help my children excel in math. Not all teachers have the required time or proficiency levels required to teach mathematical concepts, which can be complex and fast paced especially in high school. We are happy we came to mathnasium to help fill the gap. We really appreciate all the help my daughter is getting with you. She really likes the tutors and feel very welcome and comfortable there. I have already recommended you guys to all my friends. My son’s math skills improved a lot. He shows a lot of interest in math now. Great tutoring..great program . I highly recommend Mathnasium. The best place to go. Marie was always coming back happy after the session at Mathnesium. She understands now division and multiplication that caused a big problem before and is confident going back to school. Thank you so much Alberto and all the teachers that helped Marie with understanding gr.4 math over this Summer. Dylan really liked his tutoring and it gave him more confidence and someone to ask to do his homework. In addition having dedicated time set aside to do his homework was very helpful. We live quite far outside Kanata so making it there within the regular hours was a bit of a challenge but it was helpful. Our grandson was engaged by the non judgemental one on one instruction method and instant feedback. He always responded in a positive way to going for the lesson. The resulting outlook, confidence and improvement at school were worth it. Richard. My son is beginning to develop a positive disposition to maths, all thank to the Mathsnasium program. He always looks forward to coming to the learning center. Mathnasium is a great place for children to master math. My daughters math skills greatly improved under their tutelage. Have already recommended it to both parents of friends and some of my students. Well worth the investment to solidify number sense skills. Staff is friendly, welcoming and knowledgeable. Brooklyn loved coming to mathnasium. We will definitely use you again in the future!! My daughter was having a very difficult time with math. She could not understand the concepts of formulas and would come home very upset. Within 2 weeks of being a part of Msthnasium her confidence had increased and for the first time she did not dread math class. Thank you for the support and aid in her success!! She love the teachers and her mark is improving. She says the noise is loud from Karate place next door though. Just to let you know. Thank you I so much for improvement in my son performance in school and confident in maths with great results from school. Alberto and his staff are doing great job. I am glad that my child is enrolled in this program, I see a remarkable improvement in her work and I love the way you give one to one attention to your students and keep giving them initiatives for doing good work. It is incredible how quickly our daughter has progressed in less than a month with Mathnasium. Gregory's confidence is growing after less than two months!